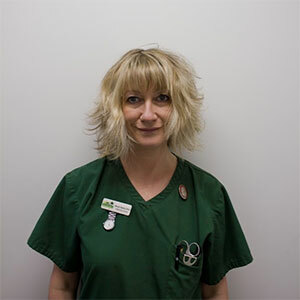 Mandy has worked at Damory since 1998. She enjoys all aspects of nursing and has a keen interest in anaesthesia and critical care. She is a clinical coach and is responsible for training the student nurses. She lives in a farm cottage with her partner Clive and their Jack Russell Terrier, Flo. "Couldn't rate these vets higher! Looked after my very poorly guinea piggy Elsa last week, he is now back to his normally happy self wheeking and running around happily with his brother pig you'd never know he'd been sick!"